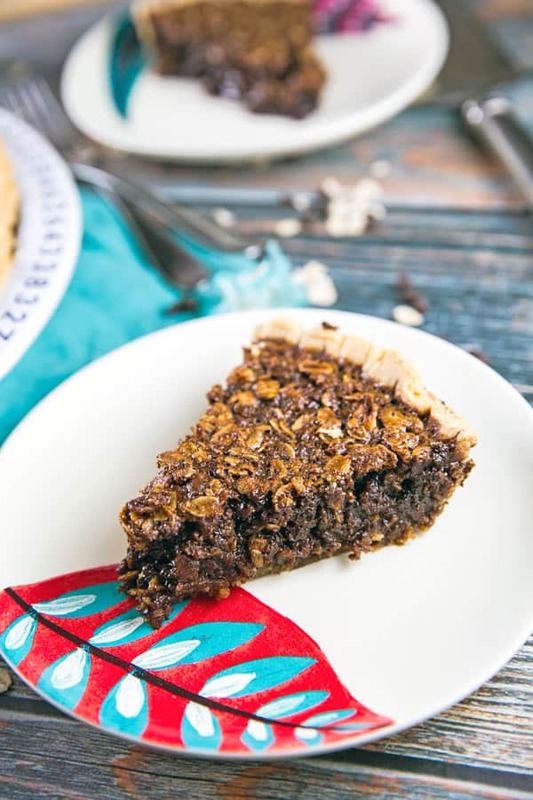 If you love the classic molasses flavor, you’re going to love this Chocolate Oatmeal Molasses Pie! Spicy bittersweet molasses with a chewy oatmeal cookie texture, all on top of a chocolate ganache-lined pie crust. It’s the perfect spicy and warming winter pie (and gluten free, too!). My yearlong series of “delicious baked things” has become one of my favorite traditions here on Bunsen Burner Bakery. In 2016, we did Quick Bread of the Month. In 2017, it was Bundt Cake of the Month. And as I hinted at in my last bundt cake post, 2018 is… drumroll please… Pie of the Month! 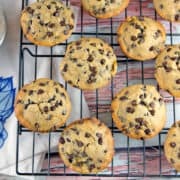 I started this project with quick breads because they’re easy, and working full time with a baby meant I wasn’t going to have a ton of extra time for complicated baking. Blogging really took a backseat in 2015 while I tried to sort out life with a newborn, and it was the perfect motivation to make sure I kept going throughout the upcoming year. In 2017, I went with bundt cakes, because quite frankly… I’m a little bit obsessed. They have become my favorite form of cake, by far. 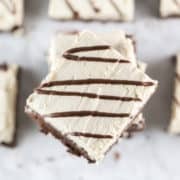 And also, they’re easy, compared to say, an intricate layer cake… and I still needed something easy to power through a full time job and life with a 2 year old. And now, this brings us to 2018. Why pie? Because I’m ready for a challenge. The timing actually couldn’t be any worse. 2018 shows no signs of slowing down, but rather being the craziest, most overwhelming year yet. And yet… well… here’s the truth. I love to eat pie. I do not love to make pie. Cutting a slice of pie gives me more stress and anxiety than anything else I make. 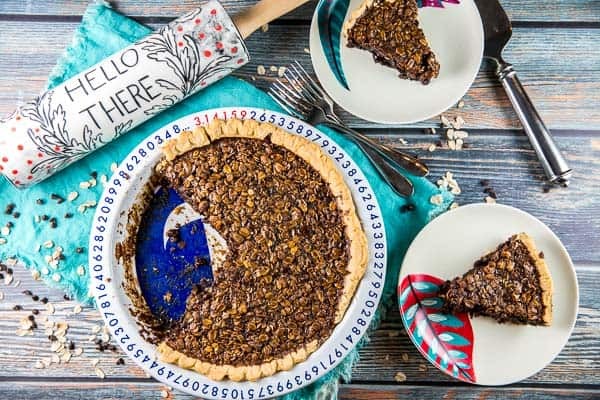 Faced with a beautiful, perfect pie, I feel nothing short of paralyzing fear at the thought of cutting into a slice, lest the crust crumble and fall apart, or the slice stick to the bottom, or it comes out in a messy blob. Meaning that… I have to make the pie again. Guys, these are not normal fears and phobias. Most people put the crumbled piece of pie on a plate and enjoy it, because it still tastes damn good. 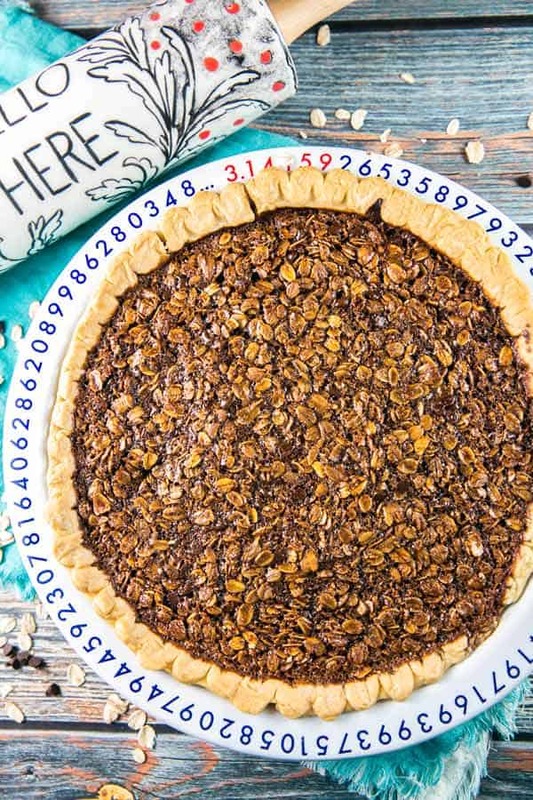 Most people are also not food bloggers, however, in need of a picture-perfect slice of pie. Three pies a month to get one worthy of sharing on the food blog? I like a good challenge. And hopefully, by the time 2019 rolls around, I will no longer hold a knife and pie server in my hand, paralyzed with fear. I’ll be ready to dig on in and cut like a pro. 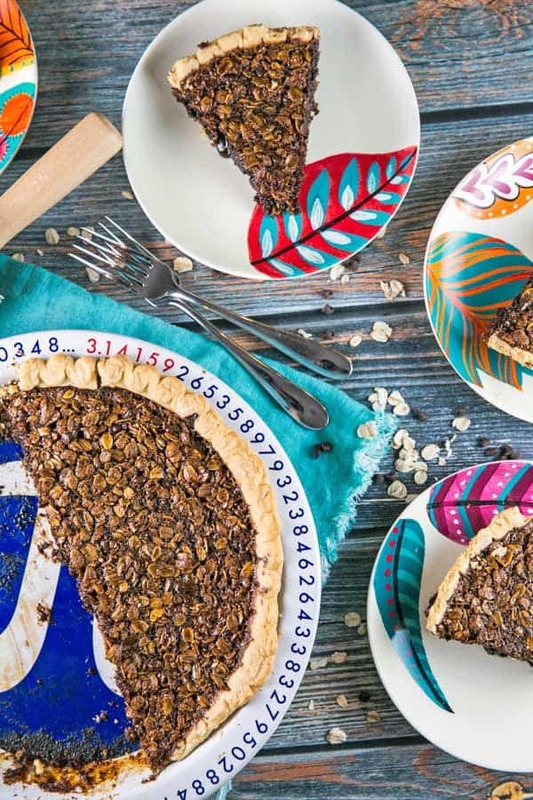 And so, this brings us to January’s Pie of the Month: Chocolate Oatmeal Molasses Pie. I think pies are seasonal more than most other desserts — cherrie pies in the summer, pumpkin pies in the fall, pecan pies for Thanksgiving. January is a tough month: a dearth of fresh produce, no major food holidays. But there’s something so warm and cozy about spicy molasses, which pairs perfectly with slightly chewy oatmeal. 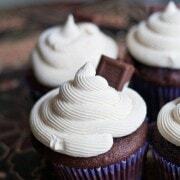 And a little chocolate because really, who doesn’t like a little touch of chocolate? Chocolate oatmeal molasses pie has that classic bittersweet molasses flavor, the chewiness of a perfectly cooked oatmeal cookie, and an ooey-gooey chocolate ganache bottom. Yes, please! I’ve heard that oatmeal pies started in the south as a “poor man’s alternative” to pecan pies, when pecans were too expensive during the Civil War. 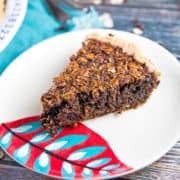 I’ve also read that oatmeal molasses pies are a Pennsylvania Dutch/Amish tradition, which makes total sense given that they are not too dissimilar from shoofly pie (one of my all time favorites!). Either way, as the name suggests, this a chocolate oatmeal molasses pie. Molasses is right there in the title – so yes, this does have a strong molasses flavor. Not a fan of molasses? Check back next month for a pie more your style. Love molasses? Grab a fork and dig in, friends… you’re going to love this one. 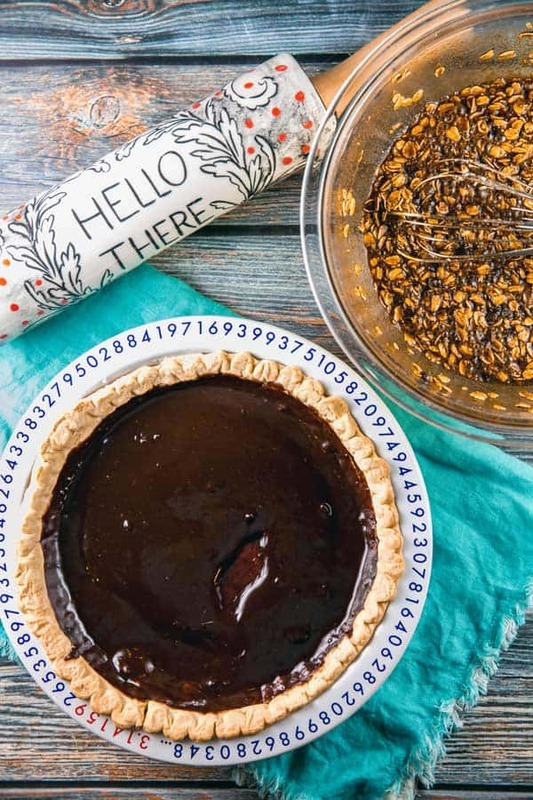 Spicy bittersweet molasses with a chewy oatmeal cookie texture, all on top of a chocolate ganache-lined pie crust. Fit pie crust into a 9-inch pie plate and crimp the edges. Place the pie plate in the freezer for 15 minutes to allow the dough to firm up. Prick the bottom of the crust several times with a fork and cover the pie dough with aluminum foil, tucking up and over the edges of the crust. Fill the center with pie weights and blind bake the crust for 20 minutes. Allow the crust to cool to room temperature. 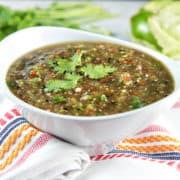 Reduce the oven temperature to 350 °F. To make the black bottom chocolate ganache layer, heat the heavy cream in a small saucepan over medium heat. Add the chopped dark chocolate and whisk until chocolate is melted and smooth. 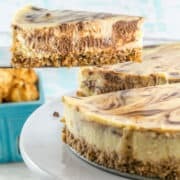 Pour the chocolate into the bottom of the crust and use a pastry brush to brush the chocolate up the sides of the pie. Place the crust in the freezer to solidify the chocolate. In a large mixing bowl, whisk together the molasses, eggs, melted butter, vanilla extract, cinnamon, and salt. 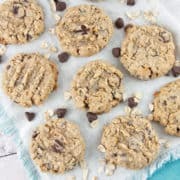 Once well combined, stir in the miniature chocolate chips and rolled oats. Remove the pie from the freezer and transfer the oatmeal molasses mixture into the crust. Bake the pie 40 to 45 minutes, until the filling is just set and slightly wobbly in the center. Allow the pie to cool to room temperature before serving. Pie will keep at room temperature up to 5 days. Looking forward to all the pies! Lol well that’s sure a nice slice! I feel your food blogger pain. 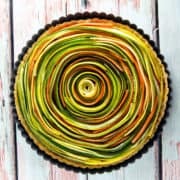 🙂 The pie looks simply wonderful! Okay, so I think it’s really annoying when people comment “how will it work with (this substitution)? ?” but do you have you tried this with blackstrap molasses? 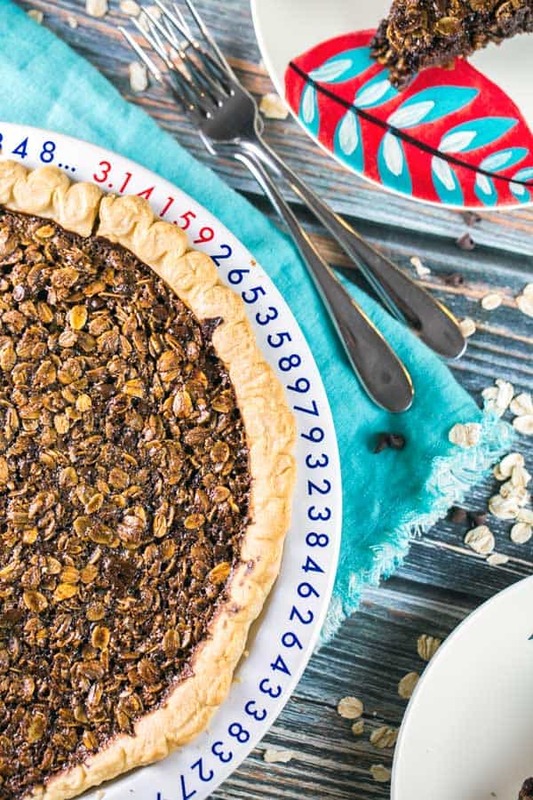 I am seeing a friend on Pi(e) Day who just had a baby last week, and think this would be a great “lactation pie” to take with me. I am going to add brewers yeast and flax meal. Using blackstrap molasses would have some benefits as well. I love everything about this comment so much! A lactation PIE is absolutely freaking brilliant! (Also, after a year of fighting and fighting to increase my supply, how did I not know that backstrap molasses is a galactagogue?!) 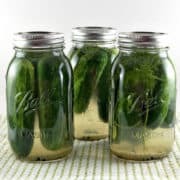 I have not tried making it with blackstrap molasses; I’d probably recommend adding some brown sugar to offset some of that super bitter molasses taste. I like molasses flavor but the blackstrap can be a little overwhelming sometimes. Start with a quarter cup and work your way up from there – taste test as you go. Let me know how it turns out! !